While we’ve been having fantastic spring weather here, there are still rainy, cool days that are perfect for a day spent sewing! I love to sew, but I don’t love to spend a lot of money for my projects. Designer patterns and fabric are lovely, but usually not in my budget! Smith-Owen Sewing & Quilting Center – great source for new and used sewing machines. A while back I saved up for a new machine and ended up buying a quality used machine. I got a machine with more bells and whistles than I was dreaming of—and a great warranty to boot! Smith-Owen also has a pretty large selection of quilting cottons. Sign up for their email list and you’ll receive an email once a month alerting you to sales and classes available. Lakeshore Sewing– I don’t have a lot of experience with them, only because I don’t live very near their stores. 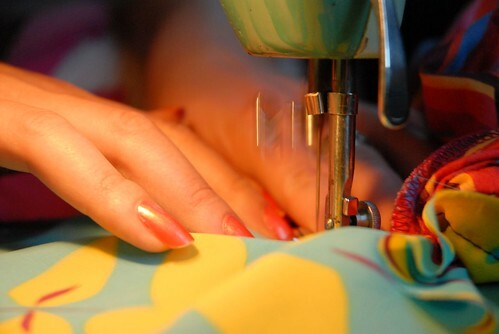 Similar to Smith-Owen, they offer new and used sewing machines, sewing machine repair, quilting cottons, and classes. Field’s Fabrics – Want to move beyond quilting cottons? Field’s Fabrics has a great selection of garment fabrics. Sign up for their email list and you’ll get one monthly email with a link to the current month’s sales. Hobby Lobby – I’m not so much a fan of their fabrics, especially the cottons. However, they do have cute buttons and trims, and a fairly good selection of notions. If the item you are purchasing isn’t a sale, make sure to use a coupon (available from the paper or online). Jo-Ann Fabric and Craft Stores – I see a lot of online crafters snubbing their nose at Jo-Ann’s. However, I don’t. They offer quite a large selection of fabrics, plus a full range of sewing tools, notions, trims, and buttons. Sign up for their mailing list to receive coupons. I never buy anything full-price at Jo-Ann’s. If you need patterns, wait for their sales – and you can get patterns from $.99 to $1.50. Some seamstresses choose not to use the patterns they sell, but I think the pattern companies have made great strides in the last few years to be relevant. Goodwill, Salvation Army, and other thrift stores – Thrift stores are great resources for vintage patterns, and fabrics to repurpose. I love to sew with vintage sheets, and have done a few projects with t-shirts as well. Yard sales – OK, so I pretty much despise yard sales! 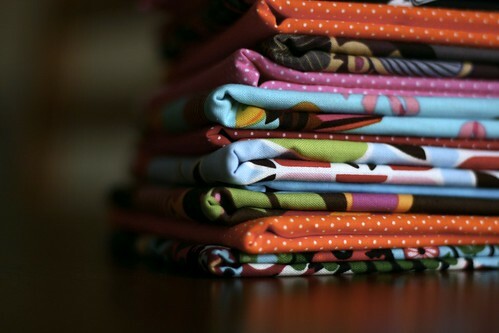 But, if my neighbor is having a yard sale I might walk across the street – and last year my neighbor was selling fabric! For $5 I got a nice stack of fabric. So far I’ve made a dress and a skirt for my daughter, plus some bibs for my niece. And I still have quite a bit left! If you love to yard sale and you sew, be on the lookout for fabric, patterns, notions, and more. Sewing doesn’t have to be expensive. Sure, it can be more expensive than buying ready-to-wear clothes (or decorations) but with sales, coupons, and smart shopping, it doesn’t have to be! How do you save money buying sewing supplies? Tammy has lived in Grand Rapids for nearly 7 years, and is a wife and stay at home mom. She enjoys learning new ways to save money, crafting, and cooking.